Reports have circulated that the public relations problem for Samsung is extending past just the Galaxy Note 7. AppleInsider can confirm that some American Airlines and Delta flights are instructing all Samsung phone users to power down, and not use their devices in flight. "Its hard to tell at a glance if a phone is a Note 7 or not," we were told when we asked about the in-flight safety briefing. "But we can tell if something's a Samsung from the aisle." It is unclear if the in-flight ban on all Samsung is on certain planes, limited to certain flights, or just made by misguided flight crew. However, the prevalence of the accounts from not only AppleInsider sources, but on social media point to a larger problem, at least from a public relations standpoint. "There are a lot of duties that flight attendants have on board," said Association of Flight Attendants spokesperson Taylor Garland. "There has to be more staffing if this is going to be the case that they have to check every single phone for every single passenger on the plane." The U.S. Federal Aviation Association (FAA) has advised passengers not to charge or use the Galaxy Note 7. On Friday, the U.S. Consumer Product Safety Commission (CPSC) is urging all owners to turn off the devices and not use them in any way while they work out details about an official recall to prevent resale of the afflicted devices. 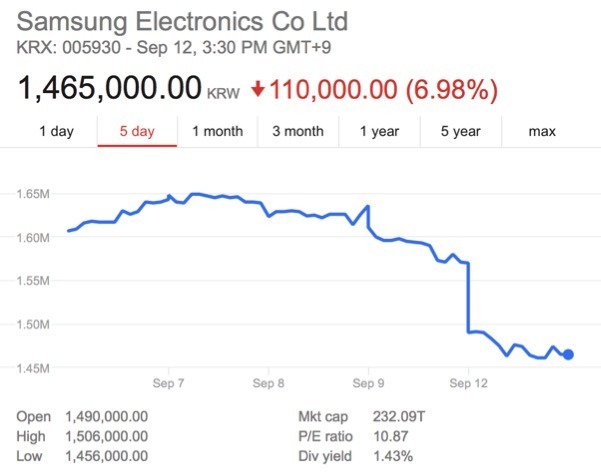 Since the FCC and CPSC statements about the matter, Samsung stock has declined 10.6 percent, with Monday's 7 percent drop its biggest one-day price decline in 28 years. It was relatively unaffected by Apple's "See You on Sept. 7" iPhone 7 release, climbing 1.1 percent after the event. The problem, initially linked to the charging circuitry, has been pinned on an issue with the battery cell. Based on our investigation, we have learned that there was an issue within the battery cell," Samsung noted. "An overheating of the battery cell occurred when the anode-to-cathode came into contact which is a very rare manufacturing process error." Samsung has announced that boxes of the device not susceptible to the charging problem and battery detonation will be marked with a blue "S" in a white circle. 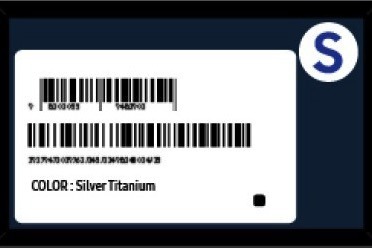 An IMEI database will go live on Sept. 13 to flag un-repaired devices. Carriers report that the situation is still confused regarding how the program will be handled. Samsung is directing customers to carriers for return or replacement of the afflicted device, but there is still no stock to be doled out for people who want a Galaxy Note 7. "The gift could not have been more timely from Samsung to Apple," long-time Apple analyst Gene Munster said. "It will be a tail wind for iPhone sales. When you're debating about which phone to get, you want to hold off until the phone is safe."